Fishonly says "I started blogging because I needed a space for my written thoughts. I was also hoping to find love. I found love. If I had not started blogging, I would still be half a person." Some bloggers, writers mostly, maintain blog because they want to be read, to organize thoughts or practice. "Blogging hopefully will give me a book of posts one day," emailed one writer. Researchers blog because they value information as energy. They absorb it, add to it and pass it on. They blog to keep track of their work - both its content and process. A few see blogging literally as emailing to every one (it is cooler and more leveraged than doing "cc" and "bcc"). Some even do it to deal with recurring bouts of depression. "It is a way for me to fight old childhood wounds that labelled me and made me believe I was very stupid," said one sad blogger. Knowledge management, punditry, reaching out, sharing and giving, participating, having a voice, marketing and managing brands or a cause are some other motives to blog. No one confessed but some seem to be blogging for money. Worthy said, "Basically, I blog because I like to write. I even hope one day to do it for some sort of a living." Joshua Micah Marshall of Talking Points Memo, a political blog, reportedly makes $5,000 a month from banner ads - enough to hire a research assistant. I could track the names of those who are on my own blog roll or those who posted comments and left their name on my blog. Francesco responded "I blog because life is beautiful, in sorrow and happiness all experiences have value and are interesting. I like to write and express myself (and read what others get out of reading what I write)." Asma Mirza, a Pakistani blogger says "I blog totally for personal reasons. I want to say a lot more than what I can tell anyone, so I badly needed a blog. Moreover, there should be some place where one can say something away from all." Amie Doctolero, a Philippines blogger wrote, she blogs to "share erratic thoughts or just about anything that you can think of, and who knows it (may not or) just might affect the others' way of thinking." "It is one of the easiest things to do to boost your resume, if you get a lot of hits that is. Today's job market is really tough and I need all the good stuff on my resume that I can. If my blog gets famous, I have something to boast about in a job interview. If it does not, I do no have much to lose," commented Rafay Bin Ali, a young Pakistani blogger. Dave, who has a rich blog on human relationships, is maintaining it for collecting the opinions of people, quite like the technique I have used for this piece. He commented, "I have questions for which I would like to get lots of people's opinions. It is hard to ask many people other than through a blog." Muhammad Aurangzeb who maintaining multiple blogs posted, "Different people have different reasons to blog but for most people it is a way to keep in touch with friends and family and of course to express themselves." A famous Pakistani blogger who prefers to be recognized as G3nu1n3, posted, "I guess I have a slightly different motive. I use my blog to post items regarding daily tech news and trends. Although I am trying to keep myself informed regarding tech news for some years now, but this blog has put some obligation on me. Now because of the blog I am into a daily routine of searching the net for news to share. So in a way keeping other people informed keeps me informed. That is why I blog." Khalid Omar pointed to a post on his rich blog titled KO -- one of the best blogs with local contents and a familiar touch - he has linked a post from BackupBrain that reads, "Needed a "backup brain-offsite storage of her memory - somewhere to store all those links needed." Khalid Omar says that this is what inspired him to make this blog. "There are a multitude of details about blogging that makes it into a passion. However, at the root is a profound curiosity. Half of blogging is reading motivated by curiosity, the other half is thinking and scribbling. Together, reading, thinking, and scribbling add up to my blogging," commented Mike of Interested-Participant. Deevaan, another Pakistani blogger wrote, "For me blogs contain thoughts when I ramble on about things that matter. Blogs are like documenting life around me, precious moments captured in cyberspace. Surely, some of it is also catharsis. I had some challenges on the personal front and writing helps." DeOwl opined, "I blog because for many reasons: I guess I have stuff to say and my family and friends are tired of listening. I blog surf because Blogistan is a wonderful land full of people with amazing perspectives to share. It is an enlightening microcosm I miss in real life. Lastly, I blog what I blog because I am a journalist who needs to learn how to put their own thoughts into words." Jake says he blogs because "my family lives in too many places. When I tell the story once they can hear it over and over as many times as they want. What better use of time?" Similarly Abez, a Pakistani, blogs because, "it is an amusing way to keep in touch with my friends all over the world and can't be bothered to email. It is a nice forum to discuss things that are on your mind. I like changing layouts every few weeks and no one else will let me do that to their blog. So I have to have one myself to do it." Todd Gibson, another foreign blogger explains he started blogging "to give myself a forum for doing more art writing. I need to have the illusion of an audience - that someone, anyone - would care what I have to say in order to get myself to do the work that I wanted to do." For me, blogging is a very stimulating activity. On my multiple blogs, I keep my writings as well as playing with ideas that I want to respond to or want to instigate. They are my expressions where readers add fresh perspective or a new conversation. In an effort to know more about blogging as a trend, I have surveyed and written on why people blog? Experts say that the trend and the motives to blog are changing rapidly hence it will be interesting if this subject be studied over time. Leave your comments or come back when your motives change. Blogging is a way to communicate with old friends who are too far away, a way to answer questions that get repeated over again. That's the justification, the reason is identical to the reasons many people keep journals: To feel my way through a world that can overwhelm. Like the mouse in the Sufi parable this forced orgainization enables a giant life to be consumed in tiny tid bits that are manageable. Then when the journal is public it provides a different type of justification where experiences that seem isolated and personal are really universal and shared. Yep, blogging motives do change over time. I remember I came into blogging because at that time it seemed something totally exiting and new to do online. Then I left it after some time because I felt that my blog was compromising my privacy, and making my life a little too public. I mean it was allll there for the entire world to see: my thoughts on a daily basis, my opinions on different subjects, the little incidents and conversations in my life. The paranoia caused me to just delete my blog one fine day. But I couldnt stay away - so here I am again, with exactly the same things on my blog which caused me to run away the previous time. What is so alluring about blogging is that for a person like me who's pretty shy in real life it is an extremely convenient form of communication. Also, it is an outlet for those thoughts and feelings which may not find a verbal expression. 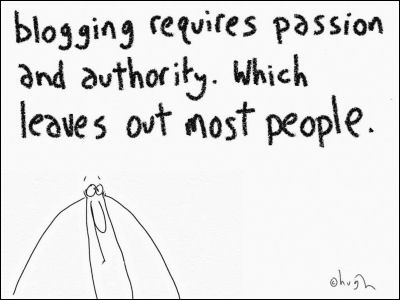 Blogging is essentially unrestrained communication - something one can never achieve in real life conversations. For years I kept all my nonsensical rants well hidden within the pages of my personal journal. Then, one fateful august morning, while surfing the net for information on the mating habits of a typical White North American Senator, I quite accidentally, double-clicked myself on to a web site that changed my life forever. blog because it helps me feel connected to so many different people; it allows me to cross paths with people i would never have met otherwise, to span th globe from a seatin my house and meet wonderful people. I began blogging though really out of feeling lonely in a new and foreign place where i had no friends. I discovered and made friends quickly through this medium and will cherish these friendships for ever. Blogging has helped me through some hard and lonely times, and it also gives me great satisfaction as i have found a little niche where i can help other people from time to time, and make a difference, however small. I began blogging with a purpose. I had just been diagnosed with breast cancer and read alarming statistics about how many women don't follow up on lumps out of fear and how many women don't have regular exams out of fear. I wanted to take the mystery out of it by sharing my journey. I wanted people to see that times have changed and that there is so much hope attached to a breast canacer diagnosis. I also wanted to be able to keep people updated on what was going on with me so that I wouldn't have to answer the same questions from so many different people as I simply didn't know if I'd have the strength to do that. And lastly, I did a lot of research and I wanted my four sisters to learn everything I learned because breast cancer occurences tend to be higher among sisters (it is all genetic). The amazing thing is that along the way, I have met a lot of people that have become such a support system for me. It has really been a blessing. I needed something to keep me occupied in the wee hours of the morning. Plus there's something about the 4-5 am silence that begs so many inspired things to be put to paper. It's like that burst of energy at the end of a long race - its exhillirating. I didn't want to write about me - I couldn't make that sort of assumption since I know very little about who I really am. I do know what I see, and I guess I have a knack for putting it into words. So my blog became a record of the way I look at the world. It's not particularly original, but I like to think it's not like everyone else's outlook either. Plus I like seeing the world through multiple perspectives, and I thought it would be cool to let other people who like to do that see mine. I started to blog because I had so much time on my hand. I had recently gone on long term medical disabilty due to Multiple Sclerosis and left a position of Vice President in a company I loved working for. I begin to become very depressed because I was no longer in contact with people daily. Once I begin to blog, I found this allowed me to reach people and have that connection I was missing. october 15, 2004 -- someone i liked broke up with me or told me to never contact him again. i was devestated. i had no other outlet but food and i didn't want to go down that avenue again, binge eating and i thought "too bad i didn't have an outlet like an online journal"....so for a few days i typed a bunch of things into GOOGLE and made some tacky looking websites that i still didn't feel comfortable with writing my thoughts and by mere accident i found BLOGGER... i started with a simple design, and just wrote my thoughts. it was an amazing release. i posted my artwork, pictures of friends, family and just wrote diary entries. that happened on october 20, 2004. i have only missed a total of three days of posting but otherwise i have written on my blog every single day since october 20th.... about something pertaining to my world. one day a stranger left me a comment. and then two comments and so on. the more people i met online the more addictive i became... to being a better friend, a better blogger, a better human. going on 7 months now of blogging... i have amazing friends i have met online thru my blog and thru other blogs. plus my friends in my town, some of my coworkers and other people i meet have shared in my joys and triumphs online. i have another website devoted strictly to my high school -- it has brought a lot of us together after having a rocky start as a new consolidated school 24 years ago. my 20th high school reunion is this summer and thru the 2nd website i have created, it has brought renewed hope and friendships together that would never have happened had i not ventured out there to create this media for my classmates. I started it for therapy--I went through a divorce and it has helped me heal. I also like the friends I have met. Shi, interesting study, what will be interesting is how many are still blogging one, two or five years from now. And if still for the same reasons. My reason for starting in November 2004 was to have an outlet for all of the stress in my life. My marriage had fallen apart and my life felt out of control. Blogging seemed like an outlet for all of the feelings of despair. For three months, I poured my heart out with nary a visitor. Then in January 2005, I had my first visitors and it exploded from there. I realized that wallowing in despair was not helpful to me and certainly not helping my visitors. So, I became a lot like Catherine for several months. Recently, I have changed again and made it more about my dating and my kids. It is all about me and what I do and who I love. Thanks for asking. I decided to blog suddenly one day. I had never even read a blog before, but I needed something to kickstart my writing. I had sunk deep into writers block and self doubt. Blogging has helped me write more (I just received news that a short story of mine is going to be published in USADeepSouth.com. First submission of mine ever accepted)and I have met so many nice people in the meantime. Another reason I blog is that I am a stay at home mom. I need some adult interaction now and then, to actually write down my thoughts and have someone understand. I love to write; I love to share parts of my experiences, I want to leave a written record to share with my children and grandchildren after I am gone. I blog to record stories about my fahter and share them with others, since there is no next generation to follow, and keep the stories alive. I have tried other blogs about myself and such-but lose interest due a lack of feedback. I started blogging because I imagined myself a pundit or wit of some kind. I read things, linked to them, and commented on them. My blog evolved and changed with the crises in my life the past year. It became my journal, the keeper of my thoughts, my hopes, my disappointments, and my dreams. It is much more personal now. Its hard to imagine NOT blogging now. I blog because I'm an aspiring novelist. Writing short daily (and sometimes more than daily) posts is akin to stretching before an athletic event. It allows me to "stretch" my brain in preparation for working on the novel. It's also proven to be a source of ideas for short stories and poems, an unexpected but pleasant side-effect. Another of those side-effects is that I've made a lot of friends in the blogosphere and it's interesting to keep up with the lives of others whom I consider to be friends, but whom I have never met, and likely never would have met were it not for this medium. Brian referred us to your blog. I started mine because I envy humor writers. However, I seem to be something of an inspirational writer--not to play up myself but the inspirational posts are the ones that get more comments and more private emails. I did show some blog comments to my editor and to a local paper and got a part time freelance position. I think blogging has helped me get a wider audience for when my book gets released this summer. I blog because I love writing and it is a way to improve your writing skills. Recognition is also a motive because by this medium i can refine my ideas, perceptions and beliefs and can also contribute in changing lives of other people in a smallest possible way. It is a way to pull out your frustrations when you are stressed. It is a perfect way to reconnect with your inner-self and it also helps u in understanding your own self. I blog because it is a way of expressing myself, sharing a laugh, sharing something that maybe can help someone else, or just a place to vent. My style, my own words. I first discovered blogging from Raed. I was fascinated and started looking for others. I both read and saw little pieces of people's lives all over the world. Once I started commenting on people's blogs I needed a way to hear back from them. It just built from there. I think it is a great way to communicate with people from all over the country and world. It is a very soothing and healing thing to do. I think someone described it as peaceful. It has made the world smaller and easier to live in. Countries have begun to have faces and personality. I blog to release tension, share my feelings, as in a diary. I share my opinions and perceptions. I'm a bit of a writer and am nowhere near any sort of publication, but on my blog people read my stuff and they like it. And my last reason for blogging is that I'm a lonely housewife who has nothing better to do while the kids are napping. I blog hoping to find some clarity.. I love the interaction with people I might not otherwise encounter. I blog for recognition and the chance to achieve my fifteen minutes (or longer) of fame. I started because my sister told me to :) I keep doing it as a form of personal journaling. I started to keep a personal recovery journal about drinking. To try to get feelings down and practice writing. I found the interaction with people commenting helpful and have built a community of folk who I can relate to. I keep personal details out as I am paranoid about being identified! I blog about stuff that I find interesting, and stuff that other people will find interesting. My real blog is at LiveJournal, and I have a bunch of "friends" added there -- people I knew in college or other friends -- so I have a pretty good idea of who's reading my blog (regularly). I also know what their interests are, so I sometimes post stuff that they'll find worth commenting about. For me its a collection of post-it notes. Occasionally I get one of my fits and write something coherent. However most of the time... a cluttered outbox for my brain. You can find in my blog many posts that may be of interest to young adults concerned about spiritual things. But I write more then devotionals and teen articles—I also blog about the struggles and joys of my pastoral life and Christian journey. It helps me sort out my feelings, digging deeper into my devotional time. Due to the public nature of blogging, I filter my entries, of course. Nevertheless, it is an excellent means of coping with stress. I started blogging, because I like to write short editorials, humoristic columns like I did in College for the school paper. I also thought perhaps friends and family would want to keep up with photographs and stuff. I enjoy writing, and also reading other people's blogs. There are some talented people out there...and it's free! Great question! I recently participated in research candidate who is doing her PhD thesis on the whole blogging phenom. I have to go with what Karen said. Besides that I wanted to show ME..what I am all about. I have learned quite a bit about the good, the bad, and the ugly. I have met very brilliant people (such as yourself). I post wat'er i feel how'er i feel and its like a second self, a mirror of me displaying in words.. I intended my blog to be a personal journal, to chart my progress toward reaching goals, to vent when I was frustrated by roadblocks. Then the blogging community found me, and that changed everything. Now I blog for entertainment, and try for a humourous style. I enjoy the comraderie of the blogging community, and reading the posts of others. I am delighted to find the quality of thought that so many people put into their blog. There really is an amazing amount of talented writers to be found. I started blogging one year ago with my siblings. We used the blog as a support tool for diet and exercise. Then I became a blog stroller and discovered there are all kinds of bloggers out there forming all kinds of blog communities. It astounded me that some of these people really have never met face to face. I wanted to join some of these communities, they sounded so friendly and so much fun. I added my comments to a few blogs that I frequent, but my comments caused offense. I guess I don't have a well-honed blog persona and you can't just jump in and start joking with people you don't know. I also started up a personal blog and disabled it from weblog listing and search detection. This is my private, portable journal. But mostly I just read other people's blogs. And I still add comments here and there, because, yeah, I like to be heard. I started blogging to keep in touch with my family during an overseas assignment that lasted 6 months. When I came back, I kept on blogging to keep in touch with the friends I left behind. Now, I blog also to vent, express my thoughts and opinions, and to have a place I call my own. My blog has become my 2nd life. because i can't not (except when i'm too depressed (and lethargic) to write much). Hm.. why do I blog? I blog because I want to keep a document of things that have thought and experienced. It'll probably be once in a blue moon that I will read them but it gives me the feeling that I have been able to experience and share it with people who want to read it. I have been to your site and I too am working very hard at adsense cash cash cash gogle google luckysign.googleearn.hop.clickbank.net machine machine power to increase my revenue. I am also looking into many NEW ways to utilize the design to further direct people to follow my ads. Because I have a voice and an opinion and I'm not scared to use them. I starting blogging because i felt i want to spread the word about goodness. To say what i believe on an open sphere. I always wanted to be a journalist. I feel this world is in so much caios, to much rivalry and hatred. I wish all that can go away with the snap of a finger, i know it won't, but i always feel that each one of us may make a difference. even if on a small scale. To do something is better than not to at all. I blog to write and publish without any hassle. Initially, I started to blog because a friend had begun publishing one. I was intrigued. Wanting to learn something new, I decided to see if I could do this. Once my blog was online, I decided that I could use it to showcase my writing skills. At the same time, I was trying to learn more blogging skills - how to make my blog better. While all of this was going on, I met new friends online. I had no idea so many people were blogging! To my surprise, I developed an audience. Now, thanks to a wise friend and astute blogger, I am continuing to learn the finer points of this art form. I also blog because I can publish without interference from others. Interesting survey, Shi! I blog for many reasons, so they never change, just that some of them are more important at certain times. Sometimes the most important one is sharing, or simply writing, or trying to get others' opinion, or just enjoy my spare time. To avoid listlessness that can take over you in no time. Like a creeping Boganvalia (not a good comparison though as people do like Boganvalia but not listlessness). Blogging is like a personal journal for me. I document my ideas, feelings about issues and this helps me to ventilate. - I love to write. - I love to share and discuss my opinions with others. - It serves as a daily diary. - I want to continue with practise of writing. - It is a platform to exhibit your creativity. - Recognition.. everyone likes to have some chunks of it. - I love it and I enjoy it! Great article, Shirazi, although I'd expect no less. The comments are impressive too. You're a spectacular moderator. I've always had a diary. Blogging is more exciting. The world gets to read you and your thoughts. They spare 5 minutes (or more) to go inside your world. That's SOMETHING. I blog to keep my creative juices flowing, to help me write fiction and articles better. I meet wonderful friends/people through blogging and sharing our lives. Having your own space online to vent and say anything someone else thinks is worth reading is great. Whatever the motives for the people to write, in OSINT (Open Source Intelligence) they make use of all this information coming from the blogosphere. There are an estimated 20 million blogs out there, and they are a valuable source of information for the intelligence community to know what is going on in certain crisis regions in the world. Simple: I blog to earn money. I sell the words and clicks are a bonus. Long before I started blogging, I used to write mass emails to friends about something funny I noticed or if I had an opinion that I wanted to voice, etc., etc. However, I never really thought of starting a blog. Now, it just so happened that I was able to visit Pakistani Punjab, along with my family, in April 2006. It was a highly momentous experience for me. The kind of affection that I received there is hard to put in words. Also, even though I already knew that people there speak the same language that I do i.e. Punjabi, I had to see the similarities among the people of the two Punjabs with my own eyes to believe them. I also discovered that just as I am a Jatt Sikh, there are Jatt Muslims in Pakistan. Hence, there is common ethnicity as well. Again, I had planned a series of emails to my friends, describing my experiences. However, the thought crossed my mind that a few blog entries might help to spread the good word far more effectively and hopefully to many more people, than any email could. Thus, my blog was born. I think it's because I want to help facilitate change. My blogs are a way for me to network with others around the world--to learn from one another in ways never before possible. I blog because it lets may say stuff without having to listen to anyone else's arguments before getting it out of my system. On other times, I also blog because I like writing and finding out what people think about what I write. 1. Blogging increases your search engine results position. 2. Blogging increases your site traffic. Your blog gives your users something to read and a reason to visit your site. Also, because your site will appear higher in the SERPs, you will attract more visitors. Your increased traffic then increases audience adoption and advocacy. Advocacy means people speaking on your behalf – clearly a wonderful thing if you can get people talking about your product, service or organisation. 3. Blogging establishes your organisation as thought-leaders in your sector. Just as giving talks establishes the speaker as an expert, blogging establishes bloggers as thought-leaders in their field. 4. Blogging provides a perfect platform for announcements. If you give your readers regular, useful, conversational content they will return to your website more often. This means you can post important announcements in your blog with confidence that they will reach the right people at the right time. 5. Blogging gives your users a space to comment. When you make announcements on a blog, the ability for users to comment means you gain immediate feedback. No more shouting into the dark and never knowing what your customers are thinking. 6. Blogging is a great platform for stakeholder communication and feedback. Bloggers are deeply connected to every interested party. A blog provides a clear channel for communications between you and your stakeholders. The big on-line conversation is already happening. You can be part of it or you can stand back and watch. I used to keep a diary when I was young. Then I stopped because I was no longer interested in the concept of writing things down by hand in a book that I'd then have to store somewhere. Blogging for me is personal and a bit of a laff. I can vent, try and be funny, keep a record of fun days out, and flex my writing fingers. I'm pleased when others read it, delighted that some leave comments but I don't make a huge effort to drum up an extensive readership. Basically I do it for me, other readers welcome. Please participate in the POLL titled "Why you blog? ", which gives you various answers in a second at my blog. AOL – cancel my account! Vincent Ferrari wanted to cancel his AOL account. It took him 21 minutes of frustration to succeed. At one point the AOL rep asked 30 year old Ferrari to speak to his dad. Unfortunately for AOL, Ferrari recorded the conversation and published it on YouTube. "If you blog, you exist." I am blogging to share my photographs and have some satisfaction. I am blogging to earn mony. If you are willing to share your experience, expertise, and insight into your own industry, you will gain readers and fans, and they will spread the word. Sharing my own insights and thoughts on business news and company offerings has significantly raised my visibility in the international business community and commensurately grown my consulting practice. The people who say, “You solved a problem I’ve had for a long time. Thank you so much.” And I get that on a daily basis on my blog. This is why I blog and love blogging. i have been blogging since 2005 and sadly its not a day to day blog. Because in my opinion one cannot have an opinion about everthing at the same time. Secondly i classify important thoughts and only write about them. Putting pictures is also a good thought but there are various other web links available for photo sharing too. My blog for me has a cathartic feel to it. When i started blogging there weren't many Pakistanis blogging then. I keep my blog personal as i have some reservations about safety online. besides why would someone be interested in what i say. So what i say is what i say for myself. You can disagree to it 100%. I found your blog today by sheer chance and im gonna follow it. Blogging is my job, my hobby and my entertainment. I love to blog because it improves thinking skills, typing speed and english grammar, make impressive. I have been blogging since 2006 and do it regularly. I love to write and love to share parts of my experiences of travel and meeting people. Thats how I recently got into blogging - in fact blogging is writing a book without paying a penny to the publisher - it is uncensored, pure, original and indigenous. It provides a forum to share views and sentiments without knowing the audiance. And beside everything, it provides an easy pass time for people like me who are otherwise spent. I blog to let him (he knows) know what I feel about him. I simply cant say that on his face. A very interesting article...in fact, the common reason behind blogging is to enjoy the freedom of expressing one's self. You maԁe ѕome rеally goоd pointѕ there. along wіth your views on thіs website.